C. fissus/dalli: small barnacle, up to 8 mm in diameter. Shell is brown-grey in color and smooth. Operculum is oval. These species are virtually indistinguishable in the field. B. glandula: bigger barnacle than C. fissus/dalli, up to 22 mm in diameter. Shell is white to gray in color. Operculum is white and diamond-shaped. Plates are deeply ridged (Morris et al. 1980). C. fissus/dalli: common on rocks, pier pilings, and hard-shelled organisms, high and upper middle intertidal zones. C. fissus extends from San Francisco, CA to Baja California; C. dalli is found from Alaska to San Diego California (Morris et al. 1980). B. glandula: abundant on rocks, pier pilings, and hard-shelled animals within the high and middle intertidal zones of bays and the outer coast from the Aleutian Islands (Alaska) to Bahía de San Quintín (Baja California) (Morris et al. 1980). Balanus crenatus typically occurs subtidally, but is occasionally present in the very low intertidal and can be distinguished from B. glandula by the shape and margins of the opercular plates. The exoskeleton plates are generally more smooth and fragile. Juvenile Semibalanus cariosus can be distinguished by the margins of the opercular plates. Acorn barnacles, Chthamalus fissus/dalli and Balanus glandula, typically dominate the high intertidal zone along the western coast of North America. Acorn barnacle species can be difficult to identify in photographic monitoring, but Balanus glandula can be distinguished from Chthamalus fissus/dalli by its larger size (to 22 mm), whiter color, and diamond-shaped operculum. The configurations of their exoskeletal plates also differ. To distinguish C. fissus from C. dalli requires dissection and microscopic examination of the opercular plates. A bent morph of Chthamalus fissus, similar to that seen in the Gulf of California species Chthamalus anisopoma, has been documented at several Long-Term Monitoring sites (Miner et al. 2005). Acorn barnacles are hermaphroditic as adults and spawn often, at variable times throughout the year (Hines 1978). The planktonic larvae can settle in incredible densities (to 70,000/m²), forming a distinct band along the upper intertidal that contain few other invertebrates except littorines and the heartiest limpets. Balanus can out-compete Chthamalus by crowding or smothering, but Chthamalus can occupy higher tide levels than Balanus because it is more resistant to desiccation. Lower on the shore, acorn barnacles mix in with the Endocladia (Turfweed) assemblage, and are also common on mussel shells. Chthamalus grows rapidly, but only survives a few months to a few years. Balanus can live longer (to 10 years), but its larger size and lower tidal position subject it to higher levels of mortality from predatory gastropods and ochre sea stars. 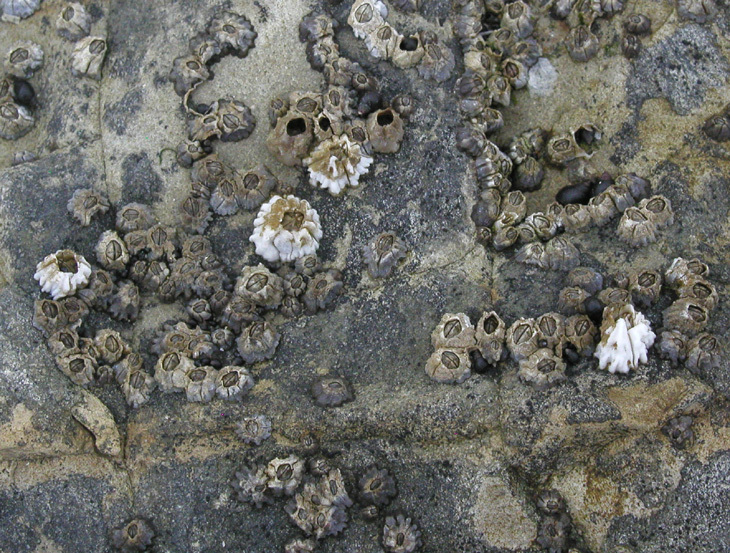 Acorn barnacles (particularly Balanus glandula) facilitate the recruitment of Endocladia and fucoid algae by reducing the grazing pressure of limpets (Farrell 1991). Long-Term Monitoring data have shown this facilitation at several sites, where barnacle plots have become slowly inundated by Endocladia, Pelvetiopsis, and Silvetia (Miner et al. 2005). Acorn barnacles are highly vulnerable to smothering from oil spills because floating oil often sticks along the uppermost tidal levels. Significant, widespread barnacle impacts were reported after the 1969 Santa Barbara oil platform blow-out (Foster et al.1971) and the 1971 collision of two tankers off San Francisco (Chan 1973). However, high recruitment rates may promote relatively rapid recovery of acorn barnacles; disturbance recovery times ranging from several months to several years have been reported (see Vesco & Gillard 1980).